Grafton Train Station is a railway station on the Western Line of Auckland's commuter rail network. 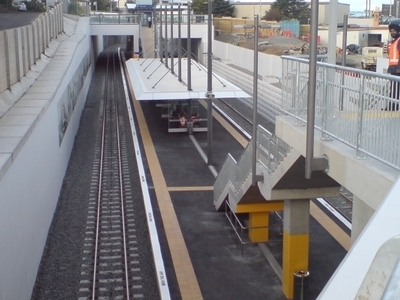 Costing $3 million to construct, it was officially opened on 9 April 2010.Grafton Station replaces the original Boston Road station and serves the Central Connector and sites like the Auckland Hospital and the future development on the Lion Brewery site, while providing direct access to their school for the hundreds of St Peter's College students who commute daily by train. The station has four entrances, as its length extends under both Khyber Pass Road and Park Road, making stairs to all four sides of the roads possible. There is also an elevator to Park Road, which also directly links the station to the Central Connector bus route on that road. Here's the our members favorite photos of "Railway Stations in Auckland". Upload your photo of Grafton Train Station!